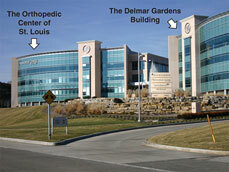 The Orthopedic Center of St. Louis is a group of eleven sub-specialized orthopedic surgeons. Our physicians care for injuries or illnesses that affect the bones, joints, ligaments, tendons, muscles, and nerves. This includes conditions such as sprains, strains, fractures, hyperextensions, tendonitis, bursitis and arthritis (see orthopedic patient information). Our services include arthroscopic surgery, spine surgery, hand surgery and foot and ankle surgery. We have extensive experience in hip, knee and shoulder reconstructive and replacement surgery. 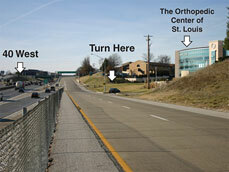 The physicians of the Orthopedic Center of St. Louis have been providing the residents of the greater St. Louis area with high quality orthopedic care for the past 15 years. Please feel free to browse our site for more information, such as office location and hours. If you have any questions or would like to schedule an appointment, please contact us. We look forward to hearing from you! Doctor (If Applicable) Please Choose A Doctor David M. Brown, M.D. Luke S. Choi, M.D. Donald A. DeGrange, M.D. Matthew F Gornet, M.D. Lyndon B. Gross, M.D. PH.D John O. Krause, M.D. Nathan A. Mall, M.D. Mark D. Miller, M.D. George A. Paletta, Jr, M.D. Mitchell B. Rotman, M.D.